Having worked with many former Kern guides I heard mixed reports of what the Kern was actually all about. However, one thought always resonated from everyone: The Forks of the Kern is just about the best multi-day trip anywhere. And with that in mind I headed south. At the end of April we decided to run a Forks training trip. The date was set for May 12th. The cost of getting equipment down to the river is expensive so I wasn’t expecting my own boat. The trip continued to grow and at some point we discovered that we would need another oar boat and, yes, I would be taking it. That was great news – for me (at the time), the only thing scarier than running big water was being someone’s passenger. Then, it turned out that my girlfriend wanted to go. Then, it turned out that my mother wanted to go. So I was left wondering exactly what the hell I had gotten myself into. They would be my paddle-assist and I now realized that the only thing scarier than being someone’s passenger is rowing your mother down class V.
Mom arrived into town on Mother’s Day just in time to help pack for the trip. The Forks is something incredibly special. When you’re not focused on the whitewater you have a chance to catch a glimpse of a very dramatic and beautiful river canyon. 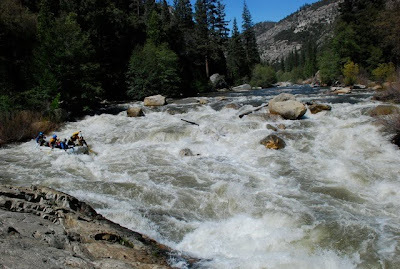 The whitewater is, of course, one of the main draws to this section of river. The thing that is most impressive about the whitewater is how continuous it is. From a statistics book, one probably wouldn’t predict the Forks to be as great as it is. The gradient is only 65 feet per mile and the run is only 18 miles. There are lots of rivers and creeks that match up and exceed both of these numbers. This is a great thing about rivers and creeks – they aren’t machines, you can’t just look at numbers, they’re dynamic and sometimes you just have to be there to see what they’re like. As guides we like to look at rapids and say “this one’s class III, this one over here is class IV-, and so on…” and I could do that for every rapid I’ve seen, but what I would prefer and what is more meaningful to me is to just say that it is “big” water and – when your mother is in the boat – it is “bigger” water. The peak of the trip for me was reaching the lead-in to Carson Falls (the last “big one”), pulling over, and walking down the scout trail. The drop led into a huge lateral hole, which, if you hit it correctly, you would punch. Otherwise, you would end up going into “The Thing” – a large nasty pour-over covering the right side of the river. I picked out a marker and knew we could hit it. We did, but we did not have enough left-angle and the monster hole zipped us straight to the lip of The Thing. Luth had hiked up from the road to take photos of the boats dropping Carson. He snapped a photo of our boat on the brink of The Thing. There is a look of horror on my face as I try to straighten the boat out, Dana looks shocked that we ended up where we did, and my mom… she’s giggling. I guess she knew we would end up just fine. 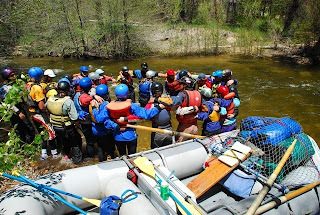 Interested in rafting the Forks of the Kern? 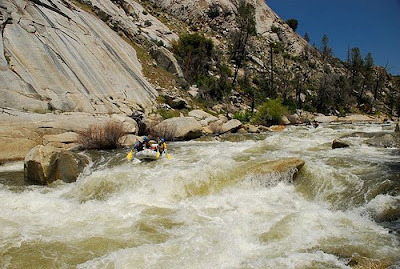 Kern River Outfitters is proud to be one of only a few outfitters permitted to run this impressive stretch of river. 2010 promises to be a great season on the Forks. The Kern River drainage is now up and over 140% of normal which all but guarantees a fabulously long Forks of the Kern season. Participants on our Forks trips must be in good physical shape and will be put through a swim-test. Prior paddling experience is a must. Trips are three days in length but two-day trips are available for charter groups. For additional information about the Forks of the Kern River, please call us at 1-800-323-4234 or visit our Forks of the Kern web page.